Hot tubs provide relaxation and offer many health benefits including soothing sore joints and muscles. Read below to see hot tub reviews, pricing and features. ThermoSpas is a great hot tub option if you’re looking for maximum customization. 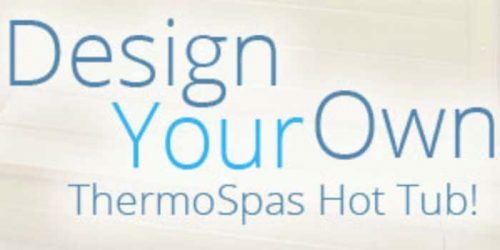 ThermoSpas provides an interactive online tool to assist you with customizing your hot tub, and a representative will come to your home to ensure that your hot tub meets your needs. Marquis Spas hot tubs contain a variety of seat designs and jet layouts to accommodate all body types. Optional accessories include a skincare system, water features, lighting and environment upgrades, and integrated media entertainment systems. If you’re looking for a long-lasting hot tub, Marquis Spas is a good choice. If you’re looking for a variety of hot tub options, Cal Spas has you covered. Cal Spas offers a large number of options with more than 55 above ground spas accommodating two to six people, eight models of swim spas including a swim spa and hot tub hybrid, and 12 in-ground spa designs. Jacuzzi offers hot tubs in multiple price ranges, with seating to accommodate from two to nine people with low-cost entry-level models (under $3,000) up to their luxury line of hot tubs (over $16,000) with unique and customized styling. 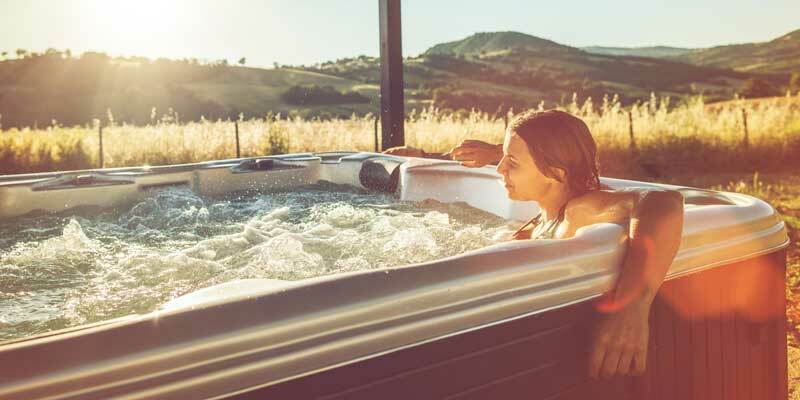 We found the best hot tub companies after evaluating 15 manufacturers, then narrowed our choices based on initial and long-term cost, customization, expert rankings of quality and reliability, customer reviews, and ease of maintenance. The four best hot tub companies we found are Marquis, Cal Spas, Jacuzzi, and ThermoSpas. This guide will help you wade through the options when it comes to choosing a hot tub. We’ll explain features and benefits specifically for seniors, give you tips for maintaining and installing a hot tub, answer questions you may have, and present our analysis of the best hot tub companies. Along with providing relaxation, a hot tub has many health benefits and soothes sore joints and muscles. A University of Oregon study reveals that hot tub use reduces heart attacks, and the New England Journal of Medicine found that soaking in a hot tub helped type 2 diabetes patients lower their insulin use and lose weight. Soaking in a hot tub can provide relief from frequent ailments such as fibromyalgia, rheumatoid arthritis, poor circulation, insomnia, joint pain, and other types of chronic pain. Avoid using pavers as your hot tub base. A concrete slab is best to avoid uneveness. Your hot tubs electrical work should be done by a professional electrician. You may need an updgraded electrical system. While a hot tub offers many therapeutic benefits, it will become a permanent fixture on your property and comes with maintenance responsibilities. Take your time with choosing the perfect hot tub for your needs. Going through a local hot tub dealer with an excellent reputation can have a significant impact on the satisfaction you get out of your purchase. While you may be tempted to cut out the middleman, this cost-cutting can cause problems later on when you need help with servicing and maintaining your hot tub. It’s especially important for consumers to have reliable, local support. Choose a hot tub dealer who has been in your community for a substantial length of time, and which offers a showroom where you can wet-test several tubs to determine the features and layout that best meets your needs. That’s right, to make the most informed decision, it is recommended you get wet in several hot tubs and spas. Make a day or two out of it, visit several dealers, and have fun with the process! Walk away from dealers who use high-pressure sales tactics or who refuse to furnish customer references. Never buy a hot tub from a fair, carnival, festival, online seller, or “big box” retailer. You are going to need advice and information about getting started with using your hot tub, water care advice and eventually, service and parts, so it’s important to choose a dealer wisely. to only a part of the component (such as a heater). or if coverage will continue if you sell your property. a percentage less as the years progress. If you’ve already purchased a hot tub with a minimal warranty and have a home warranty policy, check with your home warranty company to see if you can add coverage for your hot tub. A solid, level base is essential for a hot tub, and you will need access to all sides of the tub for repairs and maintenance. Make sure you have a safe and comfortable walkway to your spa. If you live in a cold climate, don’t place the tub so far from the house that you will never want to use it during the cold season when it would be most enjoyable. Ensure you have the correct electrical connections nearby. Some tubs will run on 120V electric, but there will be compromises unless you run on a hard-wired 220V GFCI-protected circuit, which may require electrical work. Hot tubs range in price from a few thousand dollars to $15,000 and up depending on how many luxury add-ons you choose. Expect to pay between $5,000 to $10,000 to install a quality hot tub that seats two to six people. Remember to factor in the running and maintenance costs, which vary according to where you live. These costs include electricity and water quality chemicals. Heating a hot tub can run from $25 to $50 a month, depending on the outside and water temperatures. Talk to your utility service provider about heating the tub during off periods to save money. Consumers looking solely to enjoy the therapeutic benefits of a hot tub at home will likely be satisfied with a two- or four-person hot tub. If you plan to enjoy your spa with friends, children, grandchildren or other family members, you will need to upgrade to a larger model. Soaking in several hot tubs to determine comfort and ease-of-use is very important before you buy. 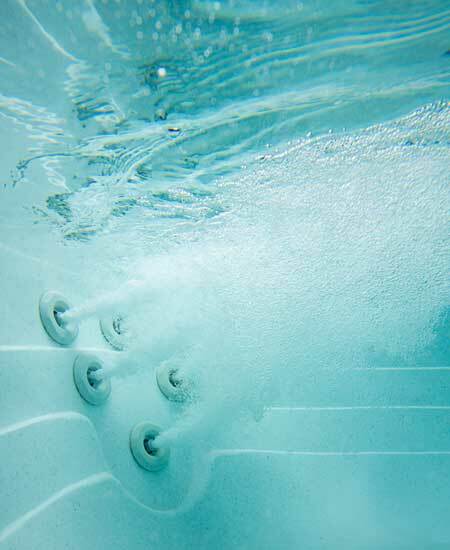 If you are interested in using your hot tub for exercise in addition to relaxation, consider a larger swim spa. A swim spa is a hot tub which has a larger center basin in addition to jet seats and uses the hot tub jets to create a water current for continuously swimming in place. Swimming and resistance hydrotherapy are excellent forms of exercise for individuals with arthritis, injuries, or chronic pain. These tubs require more space—a minimum of 10 by 8 feet for the smallest swim spas. For a smaller area, consider an exercise spa that provides resistance for low-impact standing exercises with the benefits of water therapy jetted seats. Jet number and placement is another consideration. The overall number of jets is less important than how the jets feel and how they fit your body for the relaxation and relief you need. Be sure you can be seated comfortably in the tub. Lounge seats may look appealing, but once you get into the tub, buoyancy makes it challenging to stay in these seats. Your hot tub should come with these essential accessories: a cover, cover lifter, and steps. The dealer should provide startup chemicals, on-site setup, and instruction on how to care for your hot tub. Optional upgrades you may wish to consider are media and entertainment systems, lighting, remote controls, smartphone integration, skin care systems, and aromatherapy. It’s also beneficial to have an ozonator to help with natural water sanitation. Don’t neglect maintenance. A hot tub requires ongoing maintenance, including routine draining and refilling three to four times per year. The water will need testing, treatment with chemicals, and circulation at least once or twice a day for proper sanitation. You’ll also want to stay on top of cleaning the filter regularly and scrubbing the waterline and seats. Following sanitation instructions and cleaning your hot tub will ensure it runs well for many years. After our evaluation, we chose the four best hot tub companies: Marquis Spas, Cal Spas, ThermoSpas, and Jacuzzi. Each of these companies stood out above and beyond the competition. Headquartered in Wallingford, Connecticut, ThermoSpas began manufacturing hot tubs in 1983 and changed to a direct-to-consumer business model in 1995. Jacuzzi acquired ThermoSpas in 2012. From our list of hot tub companies, ThermoSpas is the only brand not offered through dealerships, and therefore you will not be able to wet test your spa or get immediate support locally. Because of this, ThermoSpas hot tubs are best for those who have had experience with hot tub use. ThermoSpas provides an interactive online tool to assist you with customizing your hot tub, and a representative will come to your home to ensure that your hot tub meets your needs. You may save some money by purchasing a hot tub directly from ThermoSpas because they do not have the overhead expense of showrooms to support. However, essentials like stairs and cover lift are extra options rather than being included with each hot tub. 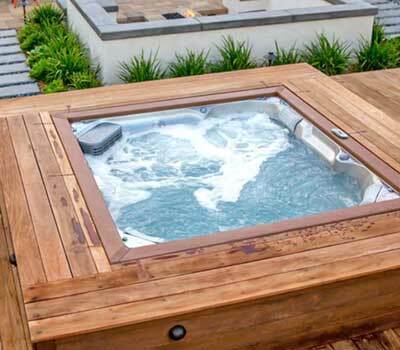 ThermoSpas hot tubs seat from three to eight people and range in price from $4,000 to $22,000. For fitness spas, they offer the Aquacisor for standing exercise and hydrotherapy and the Spa Trainer for swimming in place. Customization options depend on the model and include adding 24 to over 100 jets, up to eight shell colors and three cabinet colors, lighting packages, individual jet controls for each seat, stainless steel jets, safety rails and more. We found two Better Business Bureau ratings for ThermoSpas, a B+ and an A+. Complaints were primarily regarding the length of time it took to receive the product and have it installed, and time between reporting a repair issue and having a technician available for the repair. The company received a four out of five-star rating on ConsumerAffairs, with many happy customers. We found a complaint regarding high-pressure sales tactics. If you experience any sales pressure, contact the home office to report it. To learn more, and receive $1,250 in coupons, visit Thermospas online. Read our comprehensive ThermoSpas review for more details. 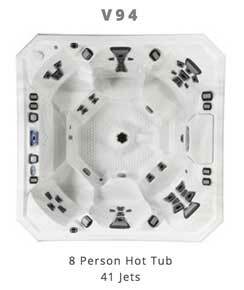 Screenshot: Marquis Spa eight-person hot tub. Founded in 1980, Marquis Spas is an employee-owned business based in Independence, Oregon, with hot tubs and swim spas that are made in the USA and sold through dealers in all 50 states and internationally. Prices vary depending on the dealer but generally range from around $4,000 to over $16,000. Marquis has a reputation for quality and reliability, and the company motto promises “The Ultimate Hot Tub Experience.” They offer 26 hot tub configurations from two-person up to eight-person spas. The Marquis line of swim spas, or ATVs (Aquatic Training Vessels) come in 14 or 17-foot options with water depth up to 53 inches and two therapy seats. Each tub contains a variety of seat designs and jet layouts to accommodate all body types. Some models allow you to switch out the jet pods to customize your experience. Optional accessories include a skincare system, water features, lighting and environment upgrades, and integrated media entertainment systems. While the aesthetics of most Marquis hot tubs could be more elegant, the company produces energy efficient models, and customer reviews note the strong, high-flow jets. Marquis ATVs are the largest swim spas of the companies in this guide. Cal Spas started in 1978 as a pool manufacturer, but when they made miniature versions of their pool designs for a county fair display, they began getting requests for acrylic hot tubs. A year later, they changed the focus of the business to solely building hot tubs. Cal Spas offers a large number of options with more than 55 above ground spas accommodating two to six people, eight models of swim spas including a swim spa and hot tub hybrid, and 12 in-ground spa designs. It doesn’t list pricing online but you can request a free quote after offering details about the kind of hot tub you need. The Cal Spas Adjustable Therapy System allows you to individually adjust the type of massage for each spa seat in the tub. Cal Spas are made in the USA and available through dealers across the USA and North America. Trading in an old hot tub will get you a discount on a new Cal Spas hot tub or swim spa. Cal Spas rates a 4.5 out of 5 stars on consumer review site ConsumerAffairs and has an A+ rating with the Better Business Bureau. Named for the two brothers who pioneered the home hot tub industry, Jacuzzi has become synonymous with hot tubs. In 1930, the company earned a gold medal award for an orchard irrigation pump after trailblazing in the aviation and agriculture industries. The brothers later turned their innovation into a submergible home hydrotherapy pump to help a young relative with rheumatoid arthritis. Further developments led to the world’s first whirlpool jet bathtub. Jacuzzi continues to innovate in the hydrotherapy industry with advancements in pump systems, jet technology, controls, and luxury design. Screenshot: Jacuzzi Hot Tub Option. Jacuzzi offers hot tubs for every budget, with seating to accommodate from two to nine people with low-cost entry-level models (under $3,000) on up to their luxury line of hot tubs (over $16,000) with unique styling. The Jacuzzi Smart Tub app lets you control and maintain your hot tub from your smartphone. While Jacuzzi sells hot tubs throughout North America and internationally, they don’t sell swim spas or fitness-oriented tubs in the United States. Jacuzzi Hot Tubs has an A- rating with the Better Business Bureau where we found some complaints under the hot tub division that were for products other than hot tubs. On ConsumerAffairs, Jacuzzi rates at 3 stars; however, this rating again includes reviews for products other than hot tubs. 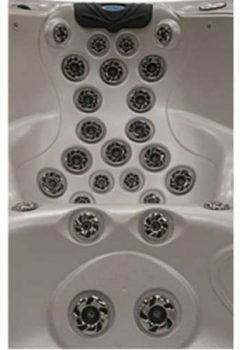 Read online reviews carefully to determine what any complaints are addressing since Jacuzzi has multiple product lines. Readers of this hot tub guide also found these related articles helpful. Don’t buy a hot tub before considering these features. Installing a hot tub in your home requires some planning. Read about how to choose the best spot, electrical requirements and more. While they don’t take as much maintenance as a pool, a hot tub requires some regular upkeep to keep it clean and in working order. What Determines Hot Tub Prices? Does insurance cover a hot tub as a medical expense? If your ailments are treatable with a hot tub and your doctor prescribes water therapy, your insurance may cover all or a portion of the hot tub expense. The amount of coverage depends on if you will have others using the hot tub or not. Keep in mind that your insurance company may restrict your choices when selecting a hot tub. Can a hot tub be claimed as a medical expense tax deduction? If your insurance company reimbursed you for the hot tub, you can not also claim the cost as a tax deduction. If not reimbursed by insurance, you may be able to claim the medical expense as a tax deduction. However, if the hot tub increases the value of your home, you must reduce the deduction by the amount of the increase in value according to the worksheet on page six of IRS document 502. Can I use a hot tub if I have a pacemaker or heart condition? Always consult your doctor before investing in a major purchase like a hot tub if you have any medical condition, but especially a heart condition. Your doctor will be able to recommend the best temperature and exposure time that you can safely tolerate. Experts advise that you stay hydrated while using a hot tub. Buying a used hot tub is never recommended. Chances are the hot tub is being sold due to problems the current owner has been unable to solve. You are buying a hot tub for stress-free relaxation, and the last thing you want is someone else’s headache. Should I own a hot tub if I intend to travel frequently? With some extra care and attention before and after your trip, you should have no trouble keeping your hot tub safe and functional if you travel regularly. Before making a final decision on a hot tub, keep maintenance and service costs in mind and make sure you understand the warranty. Owning a hot tub is a lifestyle choice that can provide just the right kind of relaxed enjoyment and health benefit you want. Follow the advice in this guide, make a list of questions to ask, and look for our four top choices in hot tub manufacturers when you shop for and test hot tubs. Keep maintenance and future service costs in mind and read warranties thoroughly.